April 2018 www.coalage.com 9 news continued Continued from p. 7... it does not know the identity of the ultimate purchaser, and that would remain the case until an agreement is reached through the broker and documentation of the sale is prepared. It wanted the PSC's blessing to sell some coal to "prudently manage" its NAPP coal supply. The target inventory level for NAPP coal at Mitchell is a 15-day supply, Kentucky Power said. As of January 29, the NAPP inventory level was more than triple that fi gure — a full 53-day supply. Moreover, the utility said it expects the NAPP inventory level at Mitchell to remain "substantially above its target level in 2018, and potentially into 2019." If it does accept a coal sale offer this year, Kentucky Power said it "would result in the instantaneous transfer of owner- ship of the coal to the third party at the F.O.B. barge loading point." The utility stressed the coal is not being sold "because of obsolescence." If the 200,000 tons are not sold this year, they could be de- ferred to 2019. 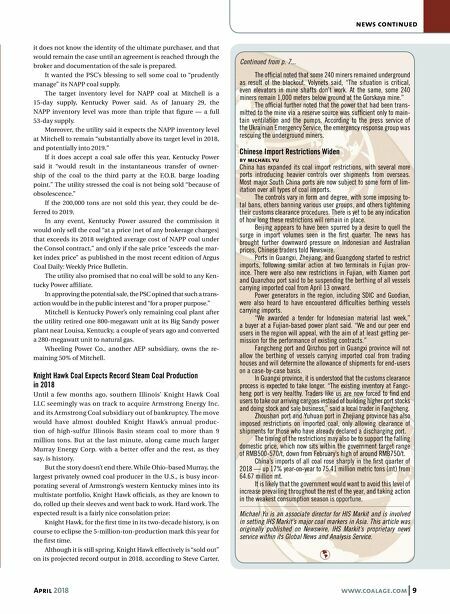 In any event, Kentucky Power assured the commission it would only sell the coal "at a price [net of any brokerage charges] that exceeds its 2018 weighted average cost of NAPP coal under the Consol contract," and only if the sale price "exceeds the mar- ket index price" as published in the most recent edition of Argus Coal Daily: Weekly Price Bulletin. The utility also promised that no coal will be sold to any Ken- tucky Power affi liate. In approving the potential sale, the PSC opined that such a trans- action would be in the public interest and "for a proper purpose." Mitchell is Kentucky Power's only remaining coal plant after the utility retired one 800-megawatt unit at its Big Sandy power plant near Louisa, Kentucky, a couple of years ago and converted a 280-megawatt unit to natural gas. Wheeling Power Co., another AEP subsidiary, owns the re- maining 50% of Mitchell. 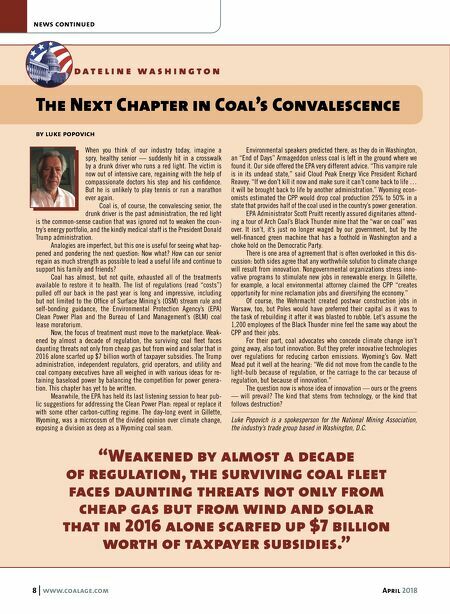 Knight Hawk Coal Expects Record Steam Coal Production in 2018 Until a few months ago, southern Illinois' Knight Hawk Coal LLC seemingly was on track to acquire Armstrong Energy Inc. and its Armstrong Coal subsidiary out of bankruptcy. The move would have almost doubled Knight Hawk's annual produc- tion of high-sulfur Illinois Basin steam coal to more than 9 million tons. But at the last minute, along came much larger Murray Energy Corp. with a better offer and the rest, as they say, is history. But the story doesn't end there. While Ohio-based Murray, the largest privately owned coal producer in the U.S., is busy incor- porating several of Armstrong's western Kentucky mines into its multistate portfolio, Knight Hawk offi cials, as they are known to do, rolled up their sleeves and went back to work. Hard work. The expected result is a fairly nice consolation prize: Knight Hawk, for the fi rst time in its two-decade history, is on course to eclipse the 5-million-ton-production mark this year for the fi rst time. Although it is still spring, Knight Hawk effectively is "sold out" on its projected record output in 2018, according to Steve Carter, The offi cial noted that some 240 miners remained underground as result of the blackout. Volynets said, "The situation is critical, even elevators in mine shafts don't work. At the same, some 240 miners remain 1,000 meters below ground at the Gorskaya mine." The offi cial further noted that the power that had been trans- mitted to the mine via a reserve source was suffi cient only to main- tain ventilation and the pumps. According to the press service of the Ukrainian Emergency Service, the emergency response group was rescuing the underground miners. Chinese Import Restrictions Widen by michael yu China has expanded its coal import restrictions, with several more ports introducing heavier controls over shipments from overseas. Most major South China ports are now subject to some form of lim- itation over all types of coal imports. The controls vary in form and degree, with some imposing to- tal bans, others banning various user groups, and others tightening their customs clearance procedures. There is yet to be any indication of how long these restrictions will remain in place. Beijing appears to have been spurred by a desire to quell the surge in import volumes seen in the fi rst quarter. The news has brought further downward pressure on Indonesian and Australian prices, Chinese traders told Newswire. Ports in Guangxi, Zhejiang, and Guangdong started to restrict imports, following similar action at two terminals in Fujian prov- ince. There were also new restrictions in Fujian, with Xiamen port and Quanzhou port said to be suspending the berthing of all vessels carrying imported coal from April 13 onward. Power generators in the region, including SDIC and Guodian, were also heard to have encountered diffi culties berthing vessels carrying imports. "We awarded a tender for Indonesian material last week," a buyer at a Fujian-based power plant said. "We and our peer end users in the region will appeal, with the aim of at least getting per- mission for the performance of existing contracts." Fangcheng port and Qinzhou port in Guangxi province will not allow the berthing of vessels carrying imported coal from trading houses and will determine the allowance of shipments for end-users on a case-by-case basis. In Guangxi province, it is understood that the customs clearance process is expected to take longer. "The existing inventory at Fangc- heng port is very healthy. Traders like us are now forced to fi nd end users to take our arriving cargoes instead of building higher port stocks and doing stock and sale business," said a local trader in Fangcheng. Zhoushan port and Yuhuan port in Zhejiang province has also imposed restrictions on imported coal, only allowing clearance of shipments for those who have already declared a discharging port. The timing of the restrictions may also be to support the falling domestic price, which now sits within the government target range of RMB500-570/t, down from February's high of around RMB750/t. China's imports of all coal rose sharply in the fi rst quarter of 2018 — up 17% year-on-year to 75.41 million metric tons (mt) from 64.67 million mt. It is likely that the government would want to avoid this level of increase prevailing throughout the rest of the year, and taking action in the weakest consumption season is opportune. Michael Yu is an associate director for HIS Markit and is involved in setting IHS Markit's major coal markers in Asia. This article was originally published on Newswire, IHS Markit's proprietary news service within its Global News and Analysis Service.